The Clinton County Shooting Stars and Wilmington’s Rodger O. Borror Middle School eighth grade basketball teams played a unified game at Wilmington College’s Fred Raizk Arena. 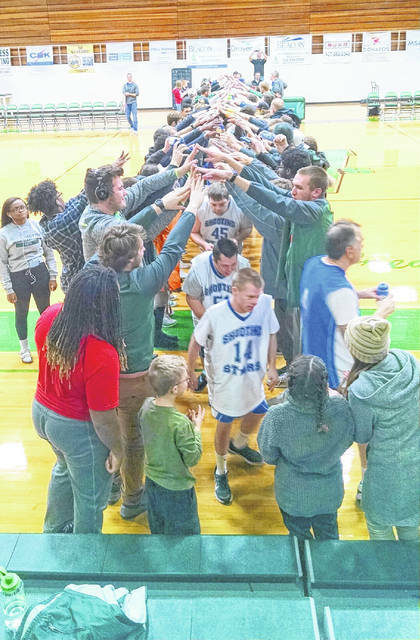 The Clinton County Special Olympics and Clinton County Board of DD noted the Wilmington College students who were on hand to support the players. “We had a great crowd and atmosphere for our athletes,” a press release from CCBDD stated. In the photos, are the players from both teams along with a tunnel for the Clinton County Shooting Stars to run through.